The winery was built with aesthetics in harmony with the surrounding landscape and in absolute respect of the standards of environmental protection. Simple and minimal lines, red brick, wood and metal arches create a final result that looks like an integral part of natural environment. 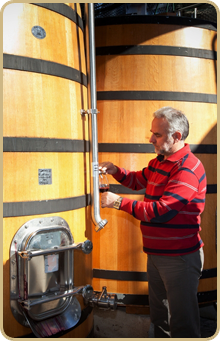 The technical equipment of the winery combines traditional qualitative winemaking methods with the most recent technological developments in the field. 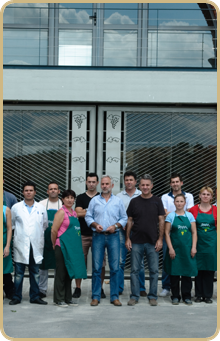 The scientists and the engineers of the estate use a combination of the latest developments of modern technology and classic qualitative methods to extract all aromas and flavors of the grape. The grapes are harvested by hand early in the morning and after destemming they are hand berry-selected. 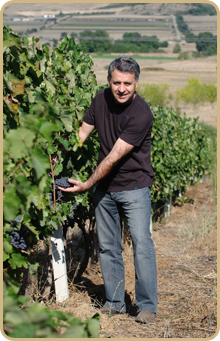 Only healthy and high quality grapes are destined for the wines of Theopetra Estate. The precious beads and vinified in inox steel and oak tanks under fully controlled conditions of temperature and environment. The slow, patient fermentation under specified temperature range ensures complexity, richness and freshness for the produced wines. Then, selected wines are aged in French and American oak barriques of 225L, in the winery’s cellar where balanced humidity and low temperature offer maturation, complexity and longevity to wine. Finally, when the wines are considered ready, they are carefully bottled in a packaging that embraces the content, it protects it and it highlights its elegance and finesse. Each wine label is produced in a very limited quantity of numbered bottles.